Stained Teeth After Braces - What To Do? Stained teeth can deliver a nasty blow to your self esteem. Some people will find that they have tooth discoloration after braces have been removed. This change in color often occurs because of the difficulty of cleaning teeth well when braces are on. There are many causes for stained teeth. Some antibiotics given in childhood can give the teeth a bluish green tinge. Genetics play a part in the color of your teeth as well. As people age, the protective enamel on the tooth becomes thing making it more susceptible to stains. Foods that stain teeth include coffee, tea, and berries. Colas and sports drinks not only contain colors that can stain teeth, they also contain acids that break down tooth enamel. Stained teeth can also be caused by sweets like popsicles, chewing gum, and hard candies. If you eat these foods and your tongue changes color, your teeth are at risk of changing color too! Poor dental hygiene can leave the teeth looking yellowish green. Certain dental procedures like root canals can also cause teeth to change color. If you want to remove coffee stains, other stains and improve the appearance of stained teeth, you have several options. Whitening toothpastes are mildly abrasive but they do not contain bleach. 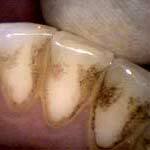 You can get whitening gels, strips and trays that contain peroxide based bleach. Whitening rinses can take up to 12 weeks to make a difference in the appearance of your teeth. If you don’t want to wait for over the counter whitening products to work, you can consider laser teeth whitening to improve the appearance of stained teeth. The dentist will apply a bleaching gel to your teeth and then use a laser to activate the gel. This procedure can even remove coffee stains from teeth. Typically this procedure takes just an hour until you are on your way to a dazzling smile.